Within the framework of the Latin American Network for Genocide and Mass Atrocity Prevention, the Auschwitz Institute for Peace and Reconciliation (AIPR), the Secretary of Foreign Affairs of Mexico (SFA), and The Stanley Foundation co-organized a training seminar entitled “Regional Perspectives on Education for Mass Atrocity Prevention,” in collaboration with the Joint Office of the UN Special Advisers on Genocide Prevention and on the Responsibility to Protect (OSAPG). The first seminar to be held on a national basis with a regional scope, the event was held on February 14-16 in Mexico City, Mexico. Oriented specifically towards members of armed and security forces in Latin America, Regional Perspectives on Education for Mass Atrocity Prevention had 3 main objectives: to familiarize participants with the processes by which genocide and mass atrocity occurs and the international standards related to its prevention, to empower participants with the practical competencies necessary to develop the means to understand and identify risk factors for genocide and mass atrocity and to adopt the necessary measures for prevention, and to analyze the relationship between human rights education for armed and security forces and its potential to contribute to the prevention of genocide and mass atrocities.The training seminar welcomed 105 representatives from different national and regional institutions, including the Secretary of the Navy, Secretary of Defense, and the Federal Police of Mexico, as well as officials from armed and security forces, Ministries of Defense, and national Offices of the Ombudsman from the region. Event activities began on February 14 with a guided visit to the Museum of Memory and Tolerance in Mexico City, followed by a cocktail reception hosted by White & Case’s office location in Mexico. The reception worked to commemorate the fifth anniversary of the Latin American Network and to launch this new modality of “national-regional” training activities. Manuel Groenewold, a Partner at White & Case, welcomed the attendees before giving the floor over to Dr. Tibi Galis, Executive Director of AIPR, and Eugenia Carbone, Director of AIPR’s Latin American Program. The opening ceremony took place the following morning and featured remarks by the event organizers. 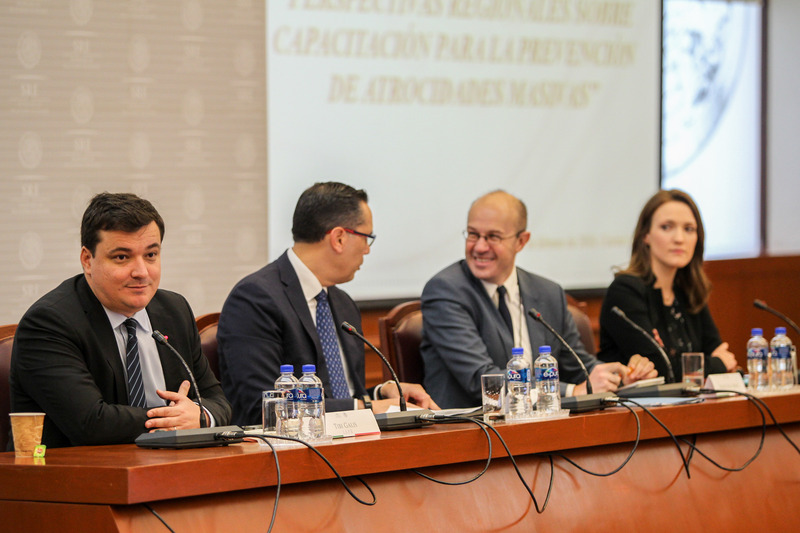 Alejandro Alday, Legal Adviser of the Secretary of Foreign Affairs, spoke first and discussed the significance of Mexico’s active participation, as a member of the Latin American Network, in the organization of this new training tool for the region. He was followed by Dr. Galis, Mario Buil-Merce, Political Affairs Officer of the OSAPG, and Kelsey Shantz, Program Associate at the Stanley Foundation. In addition to the seminar participants, the opening ceremony also welcomed diplomatic personnel from the 18 member countries of the Latin American Network. The seminar’s first day was dedicated to the introduction of the concepts of genocide and mass atrocity from the prevention perspective, an analysis of the tools provided by the United Nations system (international mass atrocity prevention standards, early warning mechanisms) and its role in prevention, as well as relevant regional tools such as the Latin American Network. Following this introduction, two modules were delivered. The first focused on risk factors and international human rights standards as they apply to armed and security forces in terms of prevention, with the second covering the responsibilities of the international community related to matters of genocide and mass atrocity. Both modules worked to foster an interactive dialogue about the role and specific experiences of the participating security sector officials. The second day of training started with a module by Dr. James Waller, Director of Academic Programs at AIPR, in which he explained how ordinary people commit genocide and mass atrocities. Following his presentation, Dr. Waller opened the floor for interactive audience participation. The day continued with a module delivered by Miguel Ramirez, from the International Committee for the Red Cross’ Delegation for Mexico, Central America and Cuba, who shared the practical scope of the armed and security forces’ preventive role in Latin America. Mr. Ramirez was followed by the Coordinator of the Professorship on Civil Protection at Uruguay’s National School of Peacekeeping Operations, Col. Luis Coitiño, who presented the role of peacekeeping operations strategies for prevention. The afternoon session took the form of a panel discussion moderated by Mariana Salazar, Coordinator of International Public Law at the Secretary of Foreign Affairs of Mexico and Focal Point of the Latin American Network. 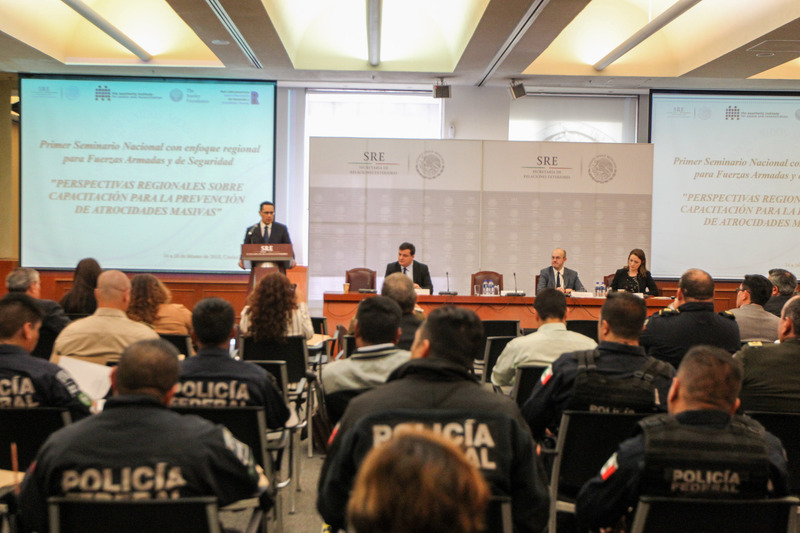 The discussion focused on analyzing and raising awareness of training strategies that have a prevention focus and allowed panelists, including representatives from the Federal Police, Secretary of Defense, and Secretary of the Navy of Mexico and the Carabineros (National Police) of Chile, to hold an active discussion with the seminar participants. Inspired by the objective of fostering initiatives that guarantee a positive impact on human rights and prevention training strategies, member countries of the Latin American Network are planning a variety of follow-up efforts following the seminar, with the support of the institutions and organizations that are committed to working in the progressive incorporation of a prevention focus and common vocabulary across institutional environments in Latin America.